Many factors can lead to data loss, such as mistaken deletion, virus attack, Windows crash, Windows update and so on. Thus, to back up files and data becomes a good way to avoid data loss. MiniTool ShadowMaker, a great backup assistant for Windows, is one excellent tool that helps you to back up files and data because it provides straightforward solutions to various backup matters. Not only can it back up files and folders, but also back up partitions and disks. 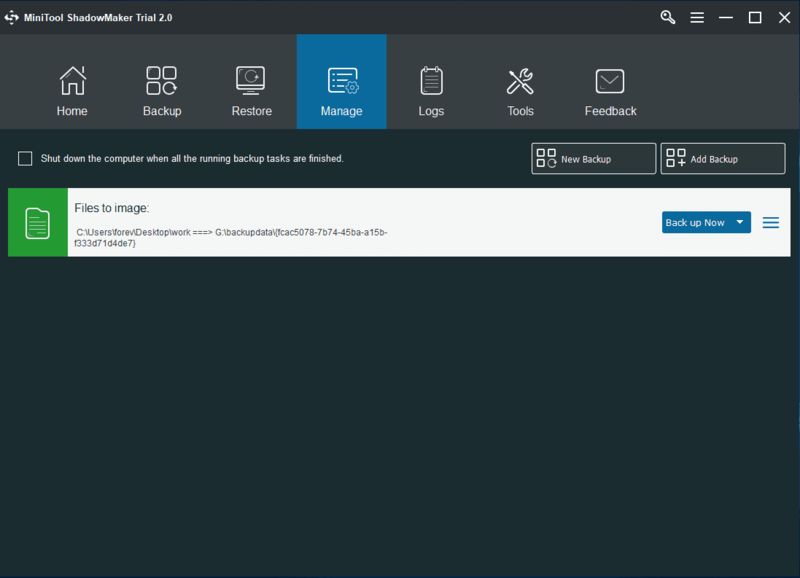 The backup software, MiniTool ShadowMaker can help you to manage your local computer. It also can manage other computers remotely after inputting IP address. This feature enables you to back up the files which are contained in the remote computer as long as the target computer is on the same LAN. Backup is one of the most important features to MiniTool ShadowMaker. 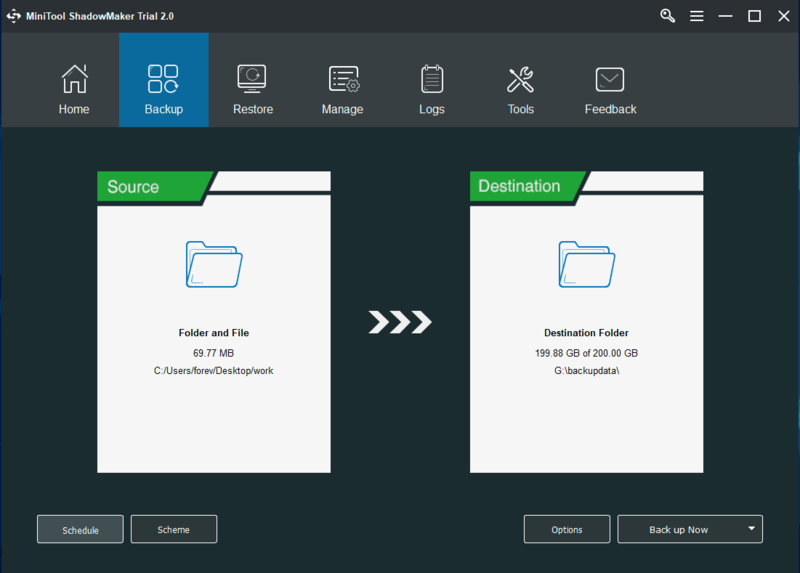 You can backup partitions and disks with previous versions, and MiniTool ShadowMaker 2.0 allows you to back up files and folders. It also offers backup options including System Backup, Schedule Backup, Event Backup, etc. Schedule backup is a very user-friendly feature, which enables you to manage backup matters on a regular basis. And you can set the backup period as you like. 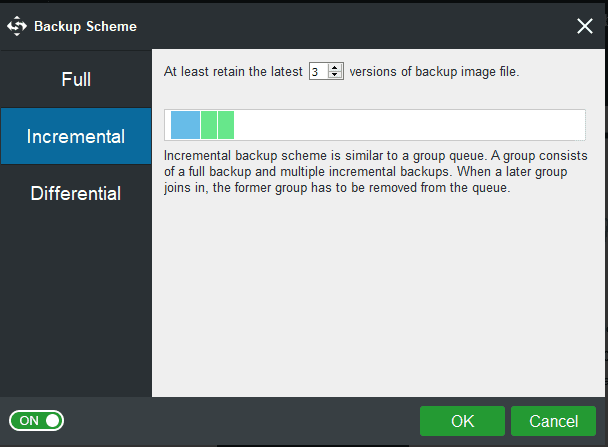 The backup scheme can help you to manage free space of your disk automatically by deleting former backup versions, which includes Full Backup Scheme, Incremental Backup Scheme, Differential Backup Scheme. The Incremental Backup Scheme is the one that saves most space. The Options is used to those users who want to pursue some advanced parameters for backup. There are many advanced parameters in the Options. And the two typical parameters are that you can set the compression level and set MiniTool ShadowMaker 2.0 to shut down your computer automatically if you know the backup process will take a long time. Of course, in the main backup interface, you can see the button “Back up Now”. Actually, there is another option which is “Back up Later” in the drop-down menu. If you want to delay the backup task, you can just click it. And then, you can see that all the backup tasks are listed in the Manage interface. Besides, you can choose the setting “shut down your computer when the backup task is finished” in the Option, this setting also can be checked in the Manage interface. If you don’t like a new Windows version or the operating system is crashed and you have created a system image in advance, you can take advantage of the Restore feature to roll back to previous Windows state. If some important files and data are lost or deleted accidentally, you can use Restore Feature to restore to a normal state as long as you have backed them up in advance. Universal Restore is another fantastic feature, acts an important role when the restored system fails to boot due to its incompatibility. If you are trying to restore the system to a different computer, MiniTool Universal Restore is useful. This utility will find and install necessities for devices that are critical for the current operating system to start up. Bootable media is a removable digital data storage medium from which a computer can load and boot an operating system or utility program. It plays a significant role when the operating system can’t boot normally. You can use it to enter the MiniTool Recovery Environment. If your operating system fails to boot, you can enter the MiniTool Recovery Environment to restore to a normal state. MiniTool ShadowMaker, the Windows backup software, has another useful feature that is disk clone. If you want to upgrade to a large hard drive, you can use this feature to clone a whole disk and it would not bring any damage to the original data. Of course, you can use it to clone the system disk to an external hard drive. And we have made some tests with some other backup software in the same environment. The test environments are CPU Intel G4400, RAM: 8G, Hard drive: Intel SSDPEKKW256G7 (Two copies. One works as system disk and one works as the target disk. ), System info: 21.2 GB Windows 10 installed on 49.4 GB system partition. 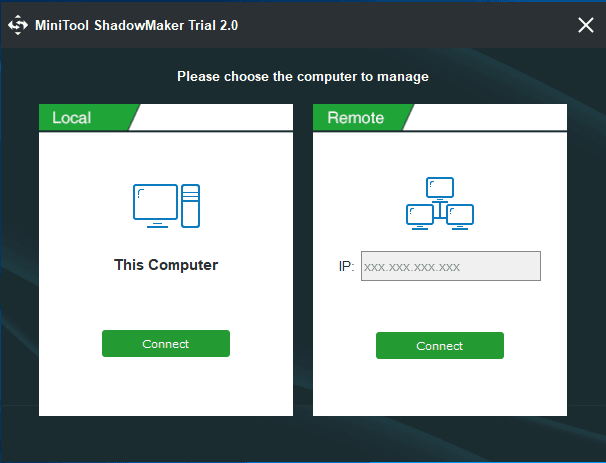 We found that the restore performance of MiniTool ShadowMaker is among the best in our test. There are some different editions of MiniTool ShadowMaker including Free edition, Trial edition, Pro edition, Business Standard and Business Technician. So users can choose any one depending on their own needs. And the Trial edition can be used for 30 days without paying a penny.